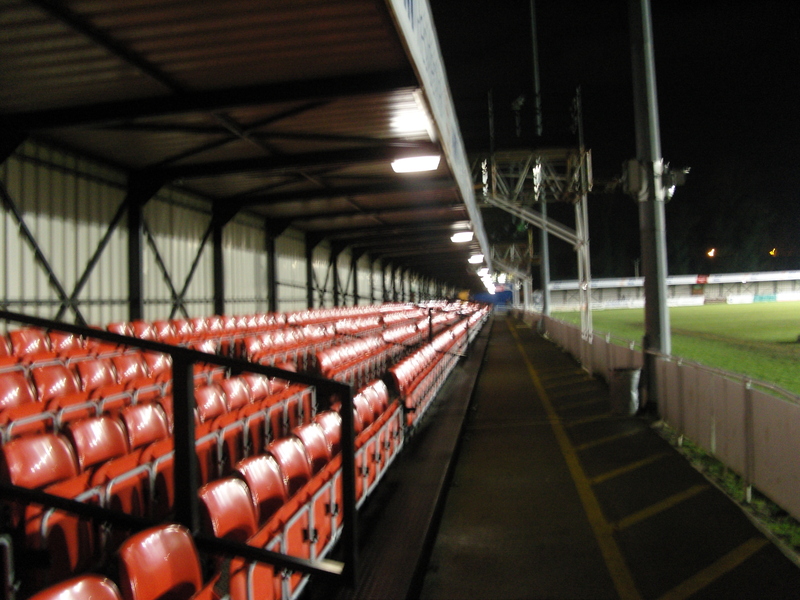 Ground Name: Glassworld Stadium (but still known to a lot of fans as Bridge Road) Capacity: 3,800 (Seats 1,700) Address: Bridge Road, Impington, Cambridge, CB24 9PH Main Telephone No: 01223 237373 Fax No: 0845 345 9235 Team Nickname: The Sutes Year Ground Opened: 1962 Pitch Size: 110 x 75 yards Home Kit Colours: Red & Black Official Web Site: www.histonfc.co.uk About the Glassworld Stadium Bridge Road, also known as the Glassworld Stadium for sponsorship purposes is actually located in the village of Impington a mile or so away from Histon. It has a capacity of 3,800 with approximately 1,700 covered seats, although they managed to squeeze a few more hundred in for the recent game versus Leeds United. Recently the ground has gone under a transformation improving its facilities ensuring that it is of astandard to allow The Stutes to take part in the Football League should they win promotion this season. The ground’s main structures are two grandstands situated at the entrance to the ground, running down one side of the pitch. Opposite is a smaller covered stand, and covered terraces are found behind each goal with four rows each. The away end is called ‘Bridge Road’ in reference to the road it runs adjacent to where you can still watch the game for free! In 2007 the Cambridgeshire FA announced that they would be setting up a new headquarters at the ground, providing more new facilities including a 500 seater grandstand. Further ground improvements were started in early March 2008. Covered terracing for the whole of the ‘Rec End’ and a seated stand running the length of the pitch opposite the Main Stand were finished in April 2008. Now the stand has been completed, approximately 800 seats have been added to the total number, bringing the stadium’s seating capacity to over 1700 seats. How to get to the Glassworld Stadium The Glass World Stadium is situated to the east of the B1049, just over half a mile north of Junction 32 of the A14, and as such is easily accessed from all directions. After leaving the A14 at Jn 32 the B1049 goes north, with the Holiday Inn on the right and then climbs to go over the old railway line with trees on both sides. The Glass World Stadium is on the right hand side next to the recreation ground as the road descends the hill. Car Parking at the ground is for permit holders only. Offical car parks for match days are run in association with The Friends of Histon & Impington Recreation Ground. Unfortunately Histon Station saw its last passengers back in 1970 when the Cambridge to St. Ives line ceased to carry passenger services.Cambridge Station is about a 10 minute walk from the City Centre. The Citi 7 bus (see below) connects Histon/Impington with Cambridge Railway Station and runs every 10 minutes. How to get a ticket for the Glassworld Stadium Unless you are planning on trying to see the major cup games against the likes of Swansea or Leeds United you will not struggle to turn up and pay on the gate. Ticket prices are £14 for a seat in the Grandstand or £13 elsewhere in the ground. 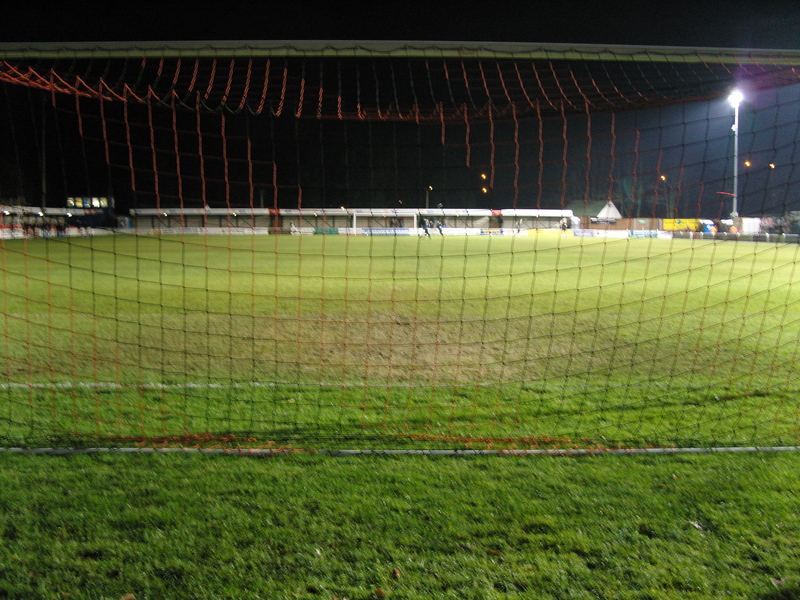 About our last visit – Histon 1 York City 1 – 9th December 2009 Approximately ten days ago very few people in the footballing world had heard of Histon FC. In fact very few people in the UK would be able to place this small village just north of Cambridge on a map at all. They like to keep their business private in this neck of the woods, and the same could be said of the football team until the 30th November when the footballing world, not only in this country, but in Europe in general were forced to sit up and take notice as Histon humbled the once mighty Leeds United in the FA Cup in front of the watching millions on live TV. Whilst many may see this as a reflection of how far Leeds United have fallen since their infamous run to the Champions League latter stages less than six years ago, it would be unfair to ignore the achievements of Histon who themselves have constructed a five year plan that will deliver them league football, passing along the way former local rivals Cambridge City and United. In constructing the plan nobody in their wildest dreams thought that after just two years they would be sitting on top of the Blue Square Conference and reaching the third round of the FA Cup. The viewers at home would not have missed the basic stadium, the rain lashed pitch or the fans hanging on the railings to get a glimpse of the action from the embankment but that is what makes the team so special. They are desperate to hang onto their semi-professional status, even if they are promoted at the end of this season, reasoning that they are on more of a sound footing that most League Two clubs. Few would argue this point as it seems more and more likely that this season will see the first club go bust mid season since Aldershot Town in the early 1990’s. In fact it is claimed that nearly half of the clubs in this lower division, surviving on average crowds of less than 3,000 are technically operating at a loss and in threat of insolvency. Which makes the Histon model so sensible. They have spent money to ensure the stadium is up to League Two standards, as well as ensuring that their key players are secured on as a long term contract as they can. The team huddled around the TV on that fateful Sunday afternoon, soaked to the skin after the victory versus Leeds United to watch King Trevor make the 3rd round draw. Match winner Matthew Langston proclaimed in his on the pitch interview that he wanted West Ham at home, and I concured with him fancying a trip to somewhere new. Unfortunately Swansea City was one of those inbetween ties. Sure it would sell out, but there was little chance of a bumper TV pay day again and the likliehood was that they would be beaten. So the club sensibly played the forthcoming tie down, focusing instead on the league form and the next round of the FA Trophy where they would play local rivals Cambridge United again for the second time in as many years. Their first task though was to enter the festive period (where they would play local rivals Cambridge twice in less than a week) at the top of the league. First up on a wild and windy Tuesday evening would be York City who were still struggling to find any consistency that would take them up the table. I had managed to arrange a trip to our Cambridge office to sort out our telephone systems, and had been promised dinner by a business associate so took the opportunity to visit the Glassworld Stadium in the small village of Histon after work Most people had the sensible idea on this very cold evening and stayed indoors. In fact the crowd was down by 700 from the last home game versus Woking on Saturday, and down by over 3,000 on the Leeds game. The good news was that I managed to break my parking record – a total of 4 steps from car to turnstile I do not belive can ever be beaten. But giddy with the breaking of this record I made a fundamental mistake of entering the stadium a full hour before the kick off. Confusing this with a Premier League ground where I could watch TV in the warm I was left standing in the cold for half an hour before the press room opened. 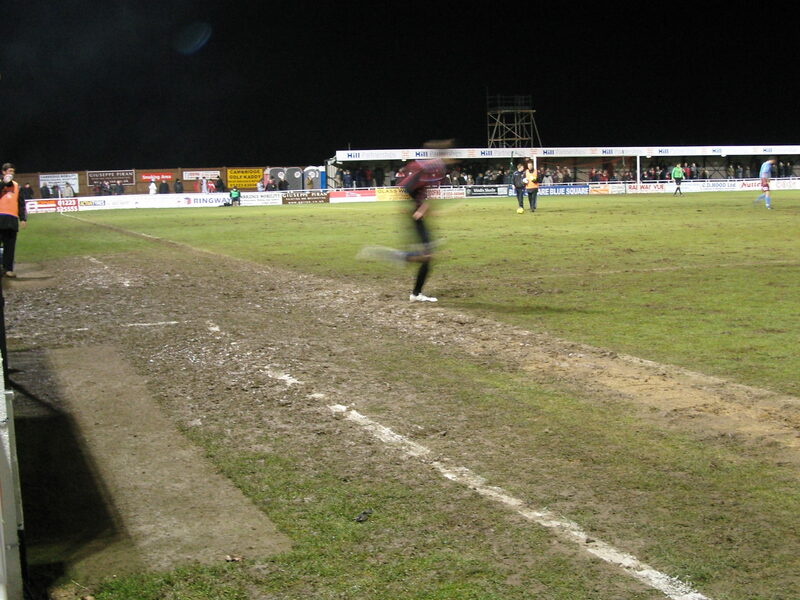 What many people may not know about Histon is that they are coached by John Beck – the same John Beck who made his name at Cambridge by over watering the pitch, relying on people with long throw ins and high fitness levels. So it was no surprise that when the game started the Histon defence peppered the York corners with long balls and started chasing them with vigour. This may have worked with effect against previous teams (in fact the club were on a 7 consecutive league win run) but York were bigger and stronger than most teams and coped well with this tactic. Whilst Histon had a chance in the first minute to open the scoring it was York who started to play with more fluency. It was strange to see such urgency from Histon to take everything quickly and undoubtably this led to the mistake which York capitalised on to take the lead, although the strike from 25 yards from Richard Brodie on 14 minutes was a bit special. Histon wasted a number of chances to draw level as they continued to look to put the balls into the corners. The pitch was hardly helping affairs as the churned mud was starting to freeze, causing uneven bobbles. Most of the crowd willed the half time whistle just for some respite from the cold, and I took my leave and headed for the warmth of the press room where a fine spread of sandwiches echoed back to cricket teas at Hartley Country Club. Histon came out unsurprisingly with all guns blazing and peppered the York penalty area with high balls and crosses. With the temperature well below zero most of the players wanted to be somewhere warm, and the game was notable for few “crunching” tackles that characterise this league. The equaliser eventually came with a Histon cross being expertly headed into his own net by York City’s Dan Parslow. A draw was a fair result in the end. York seem to have a game plan away from home was no different to how they played at Salisbury City a few weeks before, but here against high flying Histon it had a nullifying effect. I was back in the car 15 seconds after the final whistle and less than sixty seconds later on the M11 on my way south. A strange experience and thinking back I found it hard to see how Histon the team and the club would fair in the Football League if they do make it. Their rise has been meteoric but I think that they need to take stock for a season or two to really push on.